Tom Hateley's penalty for Motherwell at Celtic has caused controversy over its positioning. Motherwell's trip to face Celtic had a moment of controversy as the visitors were awarded a second half penalty. 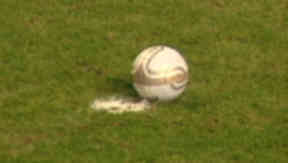 Although some fans were unhappy even at the award of the spot kick for Kelvin Wilson's challenge on Jamie Murphy, the main talking point came from Tom Hateley's positioning of the ball. Hateley placed the ball on the very edge of the penalty mark, appearing to gain an advantage with the ball closer to goal than if it had been placed squarely on the spot. Despite the protests of goalkeeper Fraser Forster, who was booked for arguing the case, referee Steven McLean allowed the penalty to be taken from the unusual position. The Celtic goalkeeper had the last laugh, however, saving the penalty to keep the score at 0-0. Gary Hooper then scored a winner for the hosts soon after. FIFA's laws of the game do not clearly state how the ball should be placed, stating only that the official has an obligation to ensure it is "properly placed" on the penalty mark. Should the penalty have been taken? Should it have been allowed to stand if it was scored? Let us know your thoughts on Twitter @STVSport or on our Facebook page.